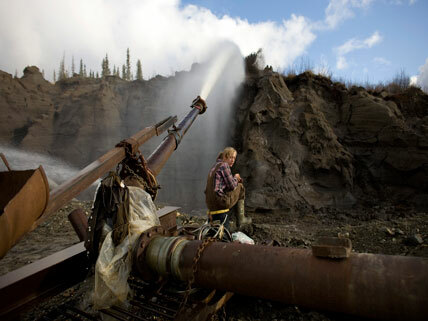 A second Yukon gold rush is under way in the Canadian northwest. Indigenous First Nations people are not alone in warning about the adverse impacts on their livelihood and the surrounding wilderness that will inevitably result. Of particular concern are the territory’s pristine watersheds that are home to caribou, wolves, grizzly bears, golden eagles—all of which may be threatened by modern mining methods and infrastructure development. Yukon has long had a regulatory environment favorable to mining, and mining companies promise to mine responsibly. For their part, conservationists urge that the inherent value of wildlife and wilderness must be central to economic calculations. Yukon lies directly east of Alaska and north of British Columbia. The territory was the site of a massive gold rush in the 1890s, triggered by discoveries on Rabbit Creek in the Klondike district in 1896. Boomtowns like Dawson and Skagway sprouted almost overnight, but the gold rush was short lived. Long gone are the grizzled prospectors with their picks panning the riverbeds. But a new wave of mineral prospecting is intensifying as gold strikes potentially worth billions of dollars have been made. Journalist Tom Clynes describes the scene around today’s Dawson: “Nowadays mining’s heavy lifting is done by a mechanized army of bulldozers, drilling rigs, and flown-in workers.” Besides gold, there is copper, zinc, and more to be found. GPS-equipped helicopters ferry prospectors from one mountain ridge to another. The resurgence in mining activity in Yukon is “the biggest geochemical exploration project on the planet right now,” according to Shawn Ryan, a central figure in the present-day gold rush. The Gwitchin, one of Yukon’s 14 First Nations, are among North America’s last true hunter-gatherers. Wild game, fish, and berries are abundant, and the lives of the Gwitchin are entwined with those of the herds of caribou that gather yearly by the tens of thousands in their traditional hunting grounds to give birth to their calves before migrating south. Understandably, the Gwitchin view the encroachments of the mining industry in terms of their human rights—a matter of cultural survival. Watch a video about four gold-mining crews who hope for a big payday in Canada’s Yukon; the website also includes links to related stories about gold exploration and mining. This more technical analysis describes the ongoing Yukon gold rush. This article recaps the history of the Yukon gold rush of the late 1800s. View over 200 photos taken during the Yukon/Klondike gold rush of the late 1890s.